The pork is simply prepared with a sweet-spicy rub, the juices that result from containing all the flavor in the pressure cooker get boiled down to make fantastic barbecue sauce. Slow and low definitely has its place, but I'm glad to be able to bring the barbecue inside in a fraction of the time most other pulled pork recipes call for. Combine sugar, paprika, chili powder, cumin, 1 tsp. salt, and 1/2 tsp. pepper, then rub mixture evenly over pork. Combine vinegar, water, ketchup, and liquid smoke in pressure cooker pot. As per the final step, the sauce takes 15-20 minutes. I pour the sauce into a fat separator and reduce the sauce in a small saucepan. If you want to reduce in your PC, you can skim the fat off. I usually keep about one cup of liquid to pour over the pork after shredding, then reduce the rest for sauce. 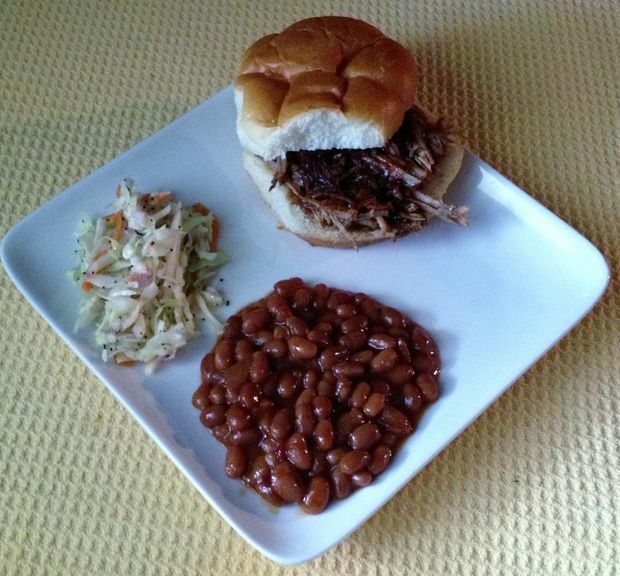 Serve on a dinner roll or Hawaiian Bun with Boston Baked Beans and Coleslaw.